Q1: Write events which occur during photosynthesis. (i) Absorption of light energy by chlorophyll. (ii) Conversion of light energy to chemical energy and splitting of water molecules into hydrogen and oxygen. (iii) Reduction of carbon dioxide to carbohydrates. Q2: What is Villi? Write its two functions. ANS: Villi are fingers like projection which presence in inner lining of small intestine. (i) It increases the surface area for absorption. (ii) Absorption of absorbed food are taken place through villi. Q3: What is bile juice? Write its function. ANS: Bile juice is a secretion of liver. (i) It helps to digest fat from intestine. (ii) It enhances the activities of enzymes. Q4: Name the enzymes which digest the followings. Q5: What is tissue fluid (lymph)? Write its three function. Ans: Lymph is tissue fluid, which is similar to the plasma of blood but colourless and contains less protein. (i) It involves in transportation. (ii) Lymph carries digested and absorbed fat from intestine. (iii) It drains excess fluid from extra cellular space back into the blood. (c) Holozoic: whole material is taken and digested inside body. Q7. What are the functions of saliva? ANS: Saliva is secreted by the salivary glands of oral cavity. (i) It softens food that helps to swallow through esophagus. (ii) It breaks down the starch into sugar. (iii) It also helps in digestion. Q8: Why do herbivores have longer small intestine than carnivores? longer small intestine than carnivores. Q9: What is the secretion of liver and its function. ANS: The bile juice is the secretion of liver. (i) Bile salts break down the some fats in the form of large globules into smaller. (ii) It enhances the enzymes action. Q10: Explain the functions of pancreas? ANS: Pancreas is an organ which secrets pancreatic juice which contains many enzymes like trypsin and lipase and its endocrine part secrets insulin hormone that controls blood sugar label. Q11: What are the end products of carbohydrate, fat, protein digestion? Fats into fatty acid and glycerol. Q12: Why does muscle cramp take place after vigorous exercise? ANS: After vigorous exercise, there becomes lack of oxygen in our muscle cells this resulting in the breakdown of pyruvate is taken. Here the pyruvate is converted into lactic acid which caused muscle cramps. Q13: Why do fish open and close the mouth and operculum during respiration? Ans: Because fish has to take breathe from dissolved oxygen from water. It occurs in presence of oxygen. Its products are ethanol, CO­2 and energy. It occurs in absence of oxygen. It occurs in yeast cell. Q15: What are the characteristics of respiratory surface? Ans: The characteristics of respiratory surface. (ii) Increased respiratory surface in area increases diffusion. Q16: Name the organ and their function in transportation? Q17: Differentiate systole and diastole? The pressure of blood inside the artery during ventricular systole is called systolic pressure. It is about 120 mm of Hg. The pressure of blood inside the artery during ventricular diastole is called diastolic pressure. It is about 80 mm of Hg. Q18: Write the functions of blood cells. ANS: Function of blood cells. RBC – It is responsible for transportation of gages and essential nutrients. WBC – it fight against foreign particles and infectious agents. Platelets –(i) It makes clot to stop bleeding. (ii) It repairs the injured and leakage blood vessels. Q19: Differentiate between xylem and phloem. Xylem – (i) The xylem carries water and minerals obtained from the soil. Phloem – (i) phloem transports products of photosynthesis from the leaves where they are synthesized to other parts of the plant. Q20: How does water enter into root cells from soil? Ans: At the roots, cells in contact with the soil actively take up ions. This creates a difference in the concentration of these ions between the root and the soil. Water, therefore, moves into the root from the soil to eliminate this difference. Q21: Differentiate blood and lymph? 1. It contains blood cells water and plasma. 2. It flows into blood vessels like veins, arteries and capillaries. 3. It carries oxygen and carbon dioxide. 1. It contains plasma water and less protein. 2. It drains into lymphatic capillaries from the intracellular space. 3. It carries digested and absorbed fat from intestine. (i) Carries blood to lungs. (ii) Brings blood to heart from lungs. (iii) Carry deoxygenated blood to heart. (iv) Take oxygenated blood to body part. Q23: Write the functions of nephrons? (i) It filters the blood in order to remove nitrogenous waste like urea and uric acid. (ii) It removes Some substances in the initial filtrate, such as glucose, amino acids, salts and a major amount of water, are selectively re-absorbed as the urine flows along the tube. Q24: Describe double circulation in human beings. Why is it necessary? ANS: Our heart pumps two times in each circulation is called double circulation. Once when Rt. Atrium collects blood from body and pushes to Rt. Ventricle to pump for lungs. Lt. Atrium collects oxygenated blood from lungs and pushes to Lt. Ventricle to pump for body. It is necessary so that oxygenated blood cannot be mixed with de-oxygenated. Q25: Write the role of four chambered heart in our body. ANS: Our body needs high energy. We get energy from oxygen. Four chambered heart does not allow mixing the oxygenated and de-oxygenated blood during pumping. Q27: Draw the structure and write the function of nephron. 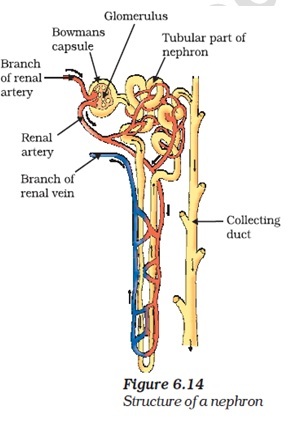 ANS: The each kidney is a cluster of very thin-walled blood capillaries. Each capillary cluster in the kidney is associated with the cup-shaped end of a tube that collects the filtered urine. Each kidney has large numbers of these filtration units called nephrons packed close together. It filters the blood in order to remove nitrogenous waste like urea and uric acid.